An�ice cream dipping cabinet is the perfect way to store, display, and serve all your frozen treat flavors. 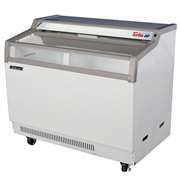 The cabinet temperature stays consistently cold to keep ice cream frozen and fresh for serving.With high quality and durable models from Turbo Air, we make it easy to find the perfect Ice Cream Dipping Cabinets for your business. Add the Turbo Air items to cart, you will find a special price.